The market is as unpredictable as spring weather and equally as hard to forecast. We should not have been surprised about a market rebound on Monday. The S&P dipped exactly to the 200-day average and the 10% correction level from February. This is exactly where it should have rebounded. The surprising part was the velocity of the rebound and the lack of any sellers. Where we normally talk about a buyer boycott as the reason for low volume market declines, Monday was a seller boycott on mediocre volume given the size of the gains. This was a major short squeeze after the strong negativity late last week. When China offered some concessions and willingness to start trade talks the bears were scared shortless. Skittish investors sitting on cash from last week raced to reload those positions. Many of the big cap stocks were up huge. In the graphics below, some of the numbers are staggering. This made it really hard to find something I wanted to play today because buying options on a stock up $6-$8 or more is a recipe for disaster since the options have inflated so much. If we can get through this holiday-shortened week without some new revelation from the White House, we could see some significant gains. Four weeks ago it was steel tariffs that tanked the market and last week it was China tariffs. As long as nothing new pops up in the headlines, the market should now be vaccinated against the tariff virus. The recent market events are a prime example of unexpected market volatility. Everything was looking great and out of the blue, we were hit with an unexpected event. If we had applied normal stop losses to all our positions, we would be starting over today because everything would have been stopped. By running without stops, we were hurt on several positions, which may not recover completely, but others are likely to rebound back into profitable territory. 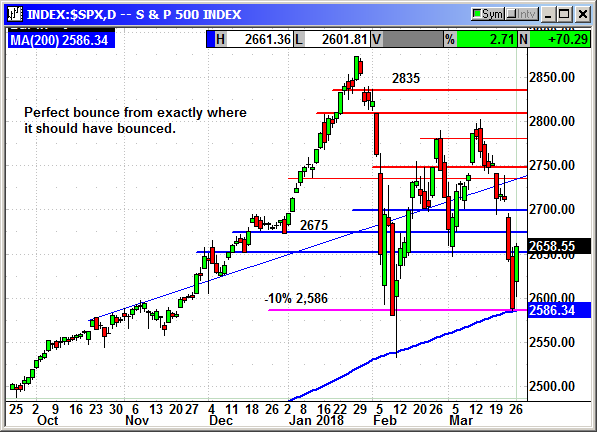 The S&P dipped to the 200-day at 2,585 on Friday and closed at 2,588. The 10% correction level from February was 2,586. The convergence of those numbers provided some strong support. 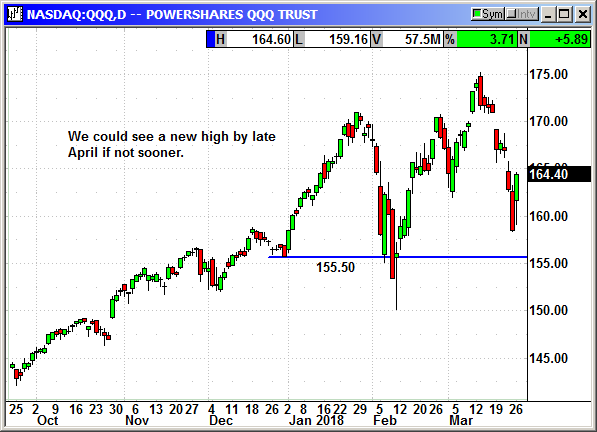 A retest of the February lows has eliminated that worry for future trading. 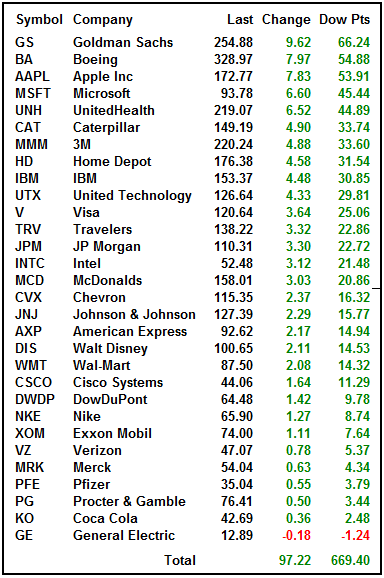 As I said above, we should be good to go for a Q1 earnings rally, as long as there are no other surprises. 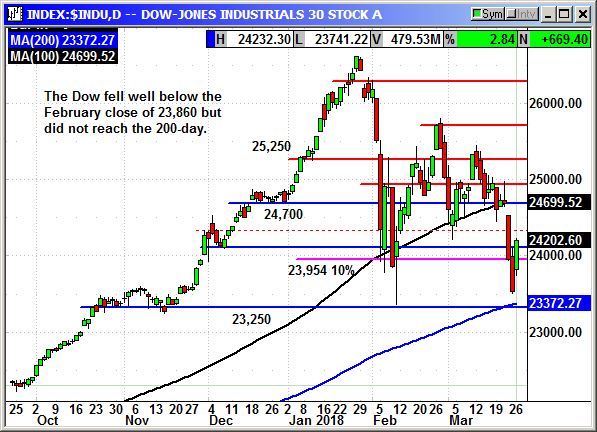 The Dow fell well below the February closing low but did not reach the 200-day average. The Dow is not normally reactive to averages because of the narrow 30 stock composition. Any two stocks having a good or bad day can force the index through the moving averages. The index recovered to close over 24,200 but the major roadblock is 25,000 and that is a long way off. The Nasdaq exploded higher with a 227 point gain or 3.25%. The big cap tech stocks were on fire. Facebook fell $11 intraday but recovered to close positive. Hopefully that crash is over because it was impacting sentiment. 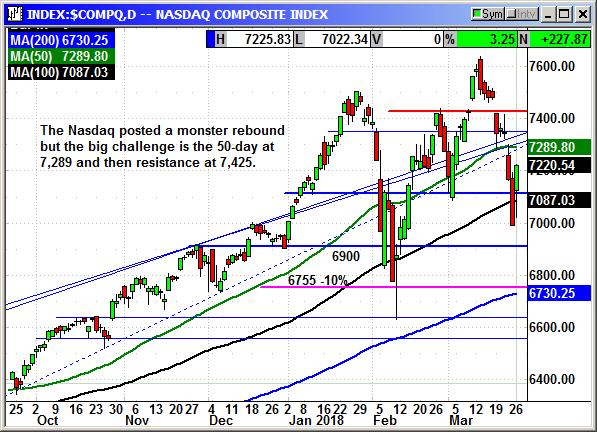 The Nasdaq has strong resistance at 7,289 and again at 7,425. 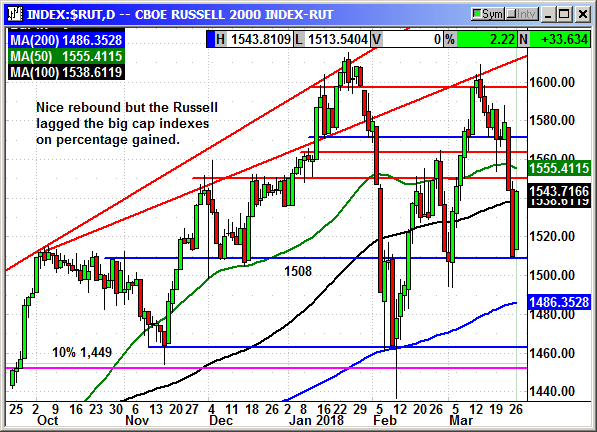 The Russell posted a big rebound but it was dwarfed by the gains in the big cap indexes. 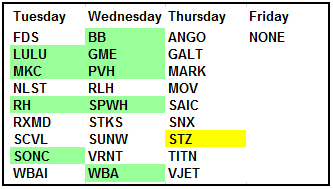 The small caps have been very volatile as you can tell by the width of the swings over the last two months. We need the small caps to rally again in order to improve sentiment. Investors believe a healthy Russell means portfolio managers are not afraid of future market declines if they are buying small cap stocks. The earnings parade is drawing to a close and the guys with wheelbarrows and shovels will be along soon to clean up after the disappointing earnings from the smallest of the small caps as they report over the next week. 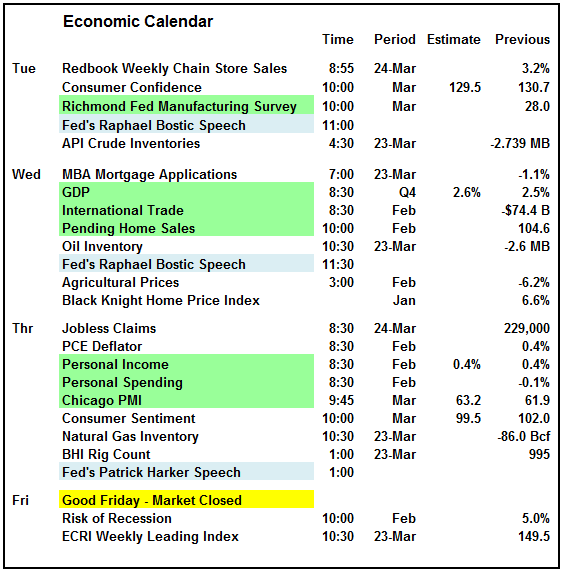 The economic calendar is busy but there are no market moving events this week. The market is closed on Friday and volume will be very light on Thursday. The S&P futures have been positive since the close with a high of +13 points and hovering around +10 as I type this. Everything could change by morning but without a new headline, we should move higher. I seriously doubt we will see another 670-point gain on the Dow but I would be very happy to see each day for the rest of the week with triple digit gains. Until proven otherwise, I think we are back in buy the dip mode. Buy June $170 call, currently $3.99, no initial stop loss. Optional: Sell short June $150 put, currently $2.53, stop loss $157.50. Buy June $55 call, currently $1.95, no initial stop loss. 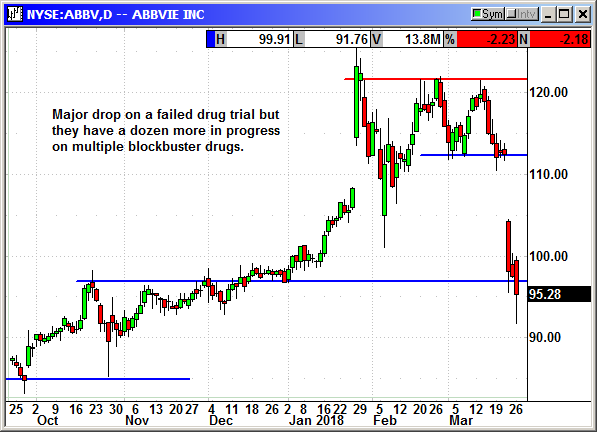 AbbVie has had a tough week. They announced a disappointing drug trial and was told to pay $3 million to a man who had taken Andro-Gel and had a heart attack. Shares fell $19 on the multiple headlines. The court threw out a $150 million jury verdict on Andro-Gel but awarded the $3 million because the company had "acted negligently." Multiple companies are being sued over similar products. Eli Lilly, Endo Pharma and GlaxoSmithKline have tentatively agreed to settle hundreds of suits. AbbVie has more than 4,000 cases still pending. The negligence verdict could be a problem because it gives the other 4,000 cases a precedent to use in their cases. After the headline related stock drop, the odds of ABBV shares returning to $115 before the May expiration are very slim. I am not going to drop the position but unless something changes quickly, it is probably dead. 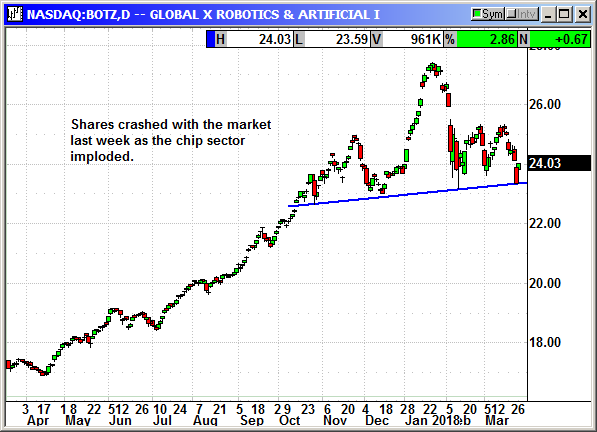 BOTZ crashed last week when the chip sector and the market declined at the same time. There was a nice rebound today when Nvidia gained $11.50. This is somewhat related to the chip stocks because of the robot/AI focus. CAT crashed again on the new China trade worries but rebounded on Monday as those worried eased. 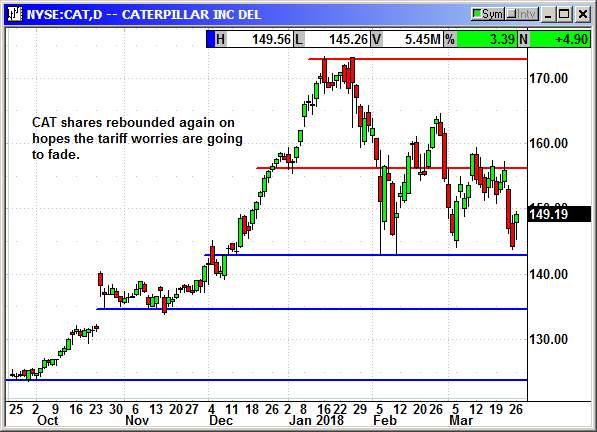 If we can make it through the week without a new tariff proposal, CAT should begin a longer-term recovery. The Chevron CEO said deepwater oil is coming back thanks to new technologies that pump the oil for miles underwater to existing topside platforms rather than building new platforms for each new discovery. Chevron is currently bringing online the 170,000 bpd Jack/St Malo with a distributed well system. Transocean's CEO saif all but a handful of the current 29 deepwater projects have breakeven costs in the low $40 a barrel range. This is great because Chevron has a lot of reserves they have not even started to develop. Will this nightmare ever end? We definitely jumped the gun on buying the Facebook dip. Shares were $185 before the scandal broke and they plunged a low as $149 intraday today after the FTC confirmed they were opening an investigation. Under a 2011 consent decree a $40,000 fine was established for every privacy violation. With 51.3 million accounts stolen in the 2014 event, that could be over $1 trillion. You can bet the government watchdogs are going to be hyperventilating over the prospect of the biggest fine in history. Obviously, it will not be $1 trillion but it could be a lot. Possibly in the tens of billions if they are found guilty. It will be years before any case ever comes to trial but the damage is being done to the stock today. The $36 drop to the intraday lows today, would have killed the position had it lasted. However, shares rebounded $11 to close over $160. At that level there is still a chance we could see a bigger recovery. Robert Baird reiterated an outperform but lowered the price target from $225 to $210. 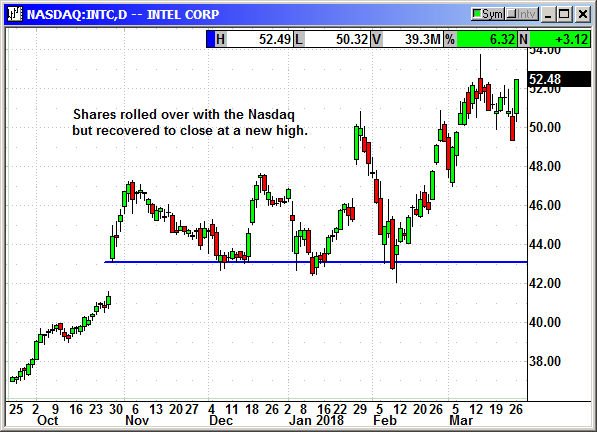 Stifel reiterated a hold and lowred their price target from $195 to $168. Bank of America reiterated a buy but lowered their price target from $265 to $230. I considered closing the position. The option with the short put moved into risk territory intraday but recovered when the stock rebounded back over $160. I am going to put a stop loss on the entire position to avoid future risk. Facebook shares fell $12.53 on Monday on news a research firm had skillfully extracted the personal information from 51.3 million accounts. The firm designed an app that could develop a psychological profile from users Facebook accounts. Some 270,000 people downloaded the app to analyze their profiles. However, users had to give the app permissions to access their friends and their friend's friends. From those 270,000 users the company garnered the information on 51.3 million accounts. This happened before 2015 when Facebook discovered the method being used and they changed their privacy policies and the capabilities allowed in third party apps. In 2015 the third party told Facebook the data had been deleted. However, recently a whistle blower said it still existed on their servers. The idea that Facebook let a third party steal private data from 51 million people crashed the stock. There is a law on the books that has a $40,000 penalty per occurrence of data theft. Obviously $40K times 51 million is a lot of money but there is zero chance it would ever happen. Facebook discovered the problem and took steps to insure the data was deleted, only they were lied to and it did not happen. Here is the key point. Nothing that happened will prevent any current users from continuing to use Facebook. Revenue will continue to grow. There will be some court cases that will take years to reach a conclusion and Facebook will earn tens of billions of dollars between now and then. Any eventual fine or reward will be painful but well within Facebook's ability to pay. The biggest challenge could be regulatory with laws passed to impose limits on data sharing and financial penalties when the law is broken. That will also take a long time because committees will have to study what is available across all the various websites including Bing, Google, Amazon, Facebook, Alibaba, Etsy, Ebay, Paypal, Visa, MasterCard, etc. If they are going to pass a law they will want to make it comprehensive. I wrote in Option Investor today that I would not recommend FB because of the high option prices for a short term position. However, in this newsletter we have the ability to reach out for a longer term and offset the cost of the options by either using a spread or selling acash secured put against the position. 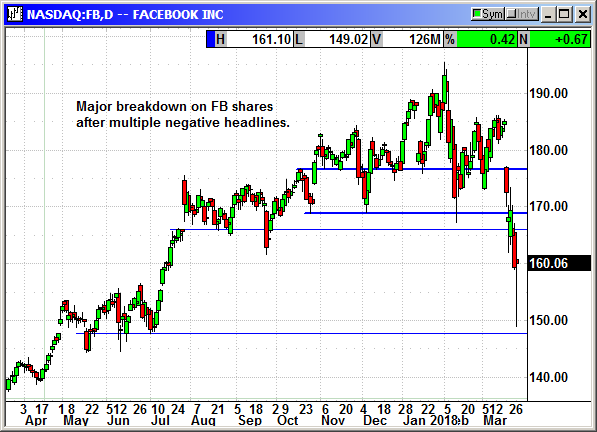 Facebook shares fell to the 200-day average and stopped at $172.50. There is strong support at $169. I believe the sell off was an overreaction and shares will rebound. It may not happen tomorrow or even this week but these headlines will pass. There are two ways to enter this position. Pick whichever works for you but not both. 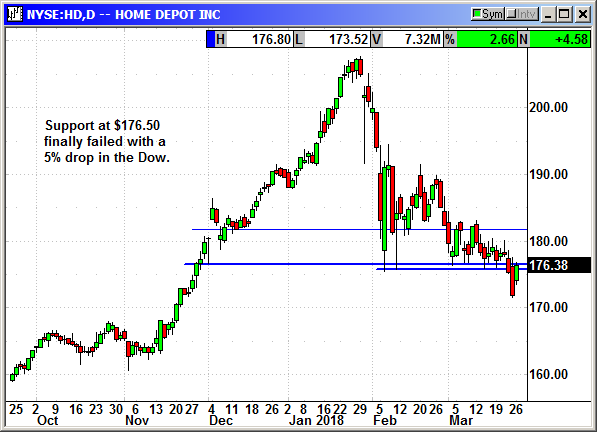 You can sell a call spread like the June $180-$200 for a net debit of $5.55 and a maximum gain of $14.45 at expiration. The second way would be to buy the June $180 call and sell a June $150 put. Lightning would have to strike Facebook shares for the stock to decline to $150. This is a company that is growing revenue at a 47% rate and has many years ahead at that rate as they monetize other products. 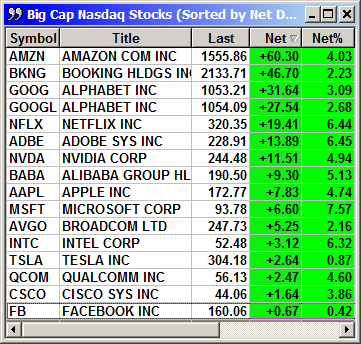 Long June $180 call @ $6.00, see portfolio graphic for stop loss. 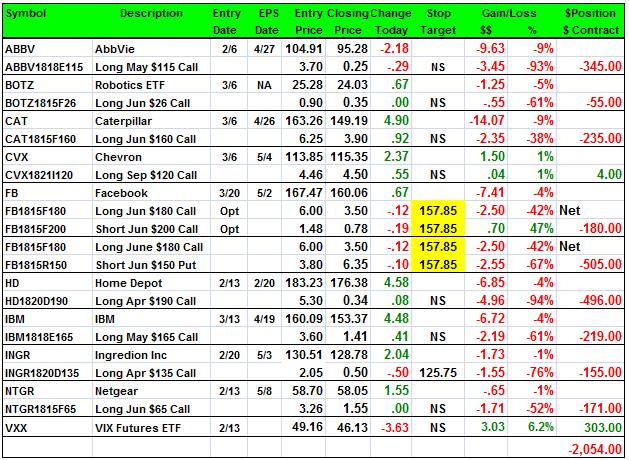 Short June $200 call @ $1.48, see portfolio graphic for stop loss. Net debit $4.52, maximum gain $15.48. 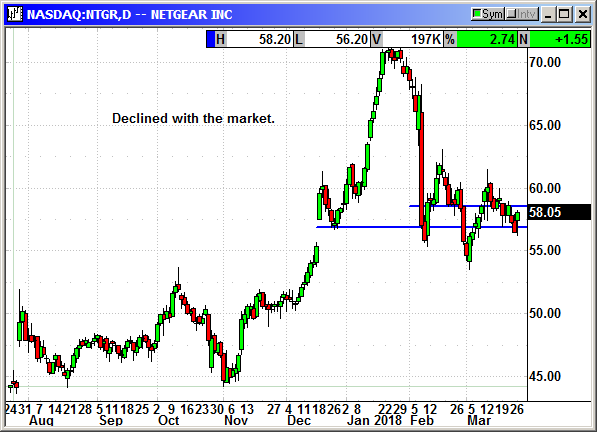 Short June $150 put @ $3.80, see portfolio graphic for stop loss. Net debit $2.20, unlimited upside. No specific news. HD shares are suffering with the Dow. 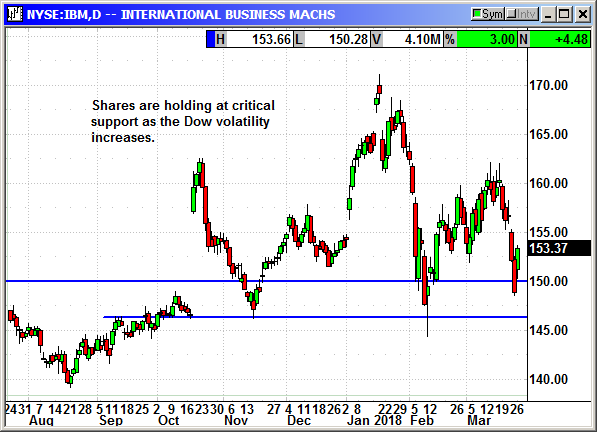 The support at $176.50 failed when the Dow fell -1,423 points from Wednesday's intraday high. There is little chance that the option will regain significant value because we are running out of time. There is no reason to close it for 34 cents so I am letting it run another week. 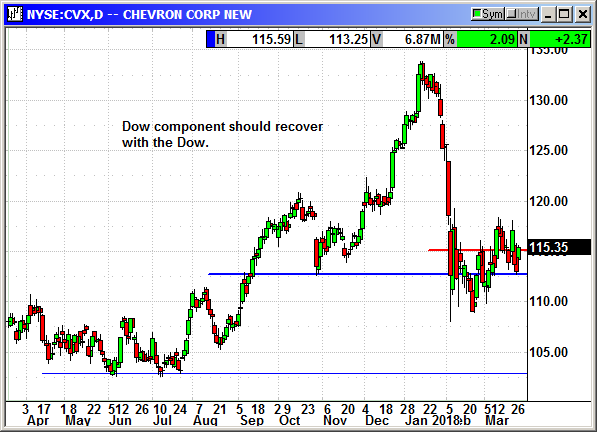 If the Dow continues higher shares could move back over $180 and inflate the option to some extent. IBM said it was entering the smart assistant market now dominated by Alexa, Siri and Google Assistant. IBM will put Watson, its AI computer on deviced it will offer to companies as a customised service. Early partners are the Munich Airport where travelers can ask robots for directions. Maserati will use Watson in its Harman Kardon speakers. Shares dipped with the Dow and should ris ewith a Dow recovery. 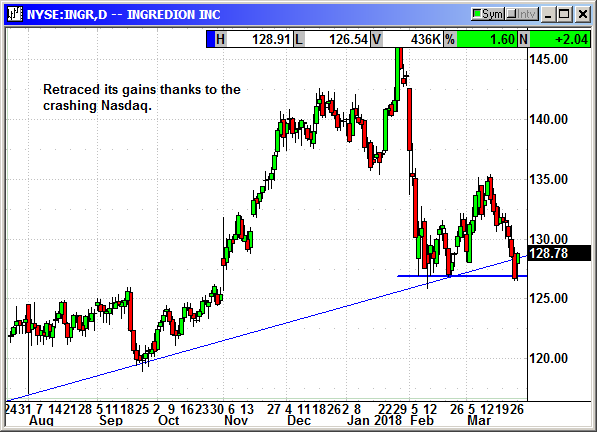 Ingredion declared a quarterly dividend of 60 cents payable April 25th to holders on April 2nd. Shares declined anyway with the crashing market. Support at $127 held. No specific news. Shares faded with the market but still showed good relative strength. Volatility spiked again with the Dow's 1,423 point drop in 3 days. Half of the gains were retraced today. 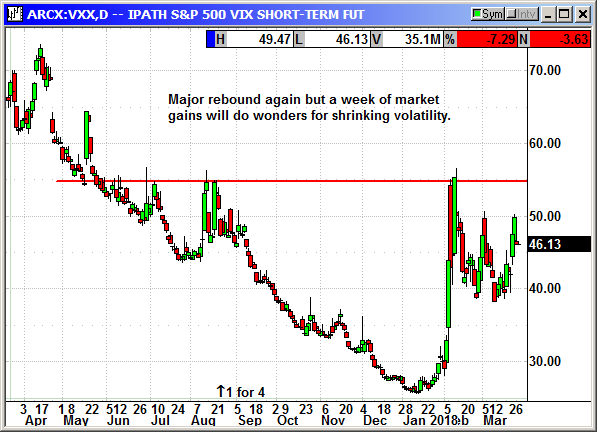 A week of positive moves could knock the VXX back to a lower low. It normally takes 4-5 weeks for volatility to return to normal after a high volatility event and we could have a couple weeks left. The VXX always moves lower.